Calcutta: a monstrous city of immense slums, disease and misery, is clasped in the foetid embrace of an ancient cult. 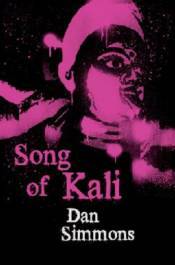 At its decaying core is the Goddess Kali: the dark mother of pain, four-armed and eternal, her song the sound of death and destruction. Robert Luczak has been hired by Harper's to find a noted Indian poet who has reappeared, under strange circumstances, years after he was thought dead. But nothing is simple in Calcutta and Lucsak's routine assignment turns into a nightmare when he learns that the poet is rumoured to have been brought back to life in a bloody and grisly ceremony of human sacrifice.